We can make the ordinary dosa bater into a healthy one by adding the spinach puree. We can make Palak dosa in a different way. 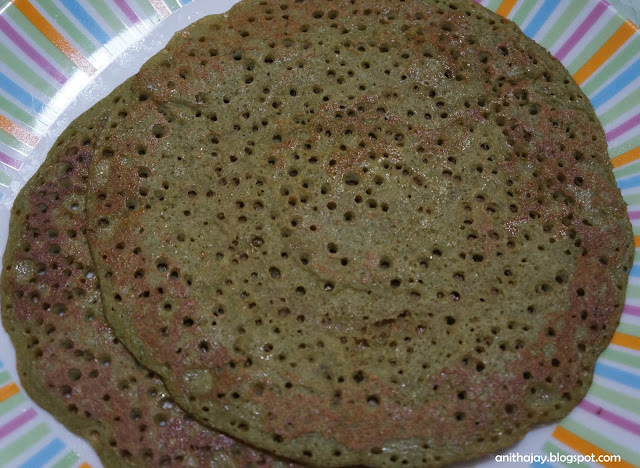 It is the easiest way making healthy dosa and kids will love this colorful dosa. Saute the spinach leaves in a pan for about 5 minutes , cool and puree it in a blender with green chilli. Add this puree in idly water , add required salt and mix well. Heat tawa , pour the spoonful of batter and spread as a regular dosa. Cook on both sides and serve hot with chutney or sambar.